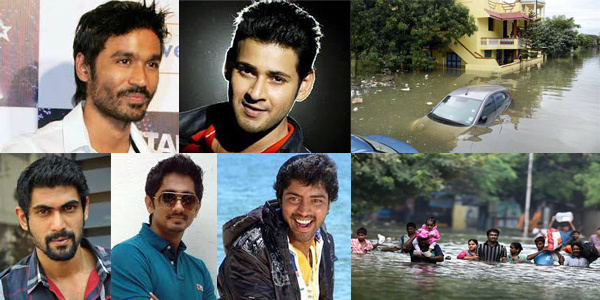 Raaga.com: South film stars and Bollywood unite under 'Mana Madras Kosam' campaign to help flood effected victims! South film stars and Bollywood unite under 'Mana Madras Kosam' campaign to help flood effected victims! After generous contribution of Rs.10 lakh from Mega Star Rajinikanth and other Southern film stars to the Chief Minister's Public Relief Fund for the relief of the victims devastated by the lethal Chennai flood, BAAHUBALI actor Rana Daggubati has began a new campaign called 'Mana Madras Kosam', (For Our Madras). The 'Mana Madras Kosam' campaign is joined by eminent South stars. Apart from Rana Daggubati the team consists of popular celebrities like Dhanush, Mahesh Babu, Allari Naresh, Siddharth, Nani, singer Chinmayi Sripada, Naresh, Allu Arjun etc. Interestingly Bollywood too has extended support for the noble cause. Bollywood celebrities like Jacqueline Fernandez, Kalki Koechlin, Boman Irani and Abhishek Bachchan are also supporting Rana's initiative and urging their Twitter followers to come forward and donate bigheartedly to the needy through Ramanaidu Charitable Trust, which is a trust made in memory of Rana Daggubati’s grandfather, the legendary filmmaker. “Our prime concern is to contribute financially, raise funds and ensure proper relief work is being carried on ground,” he added.